I'm an Animal Muse who empowers animals by giving them a "voice" as an Animal Communicator. As a Reiki Master Practitioner, I offer animals Reiki to help them feel their best. I'm also a Pet Loss and Grief Counselor to help you and pets during a difficult time. ​An animal lover since birth, I've always shared a special and unique bond with animals and nature. Since I was a child, I've recognized animals as divine spiritual beings who are wise teachers, guides, and healers. I instinctively knew animals have "voices" just like people and I easily understood animals' thoughts, feelings and viewpoints, much to the surprise of the adults around me. While studying for my Master's degree in Counseling and Education in the early 1990s, I discovered the field of Animal Communication. I also developed my intuition with the support and guidance from my dog and "animal muse," KC the Keeshond. After receiving my Masters degree, I felt called by the animals to become a an Animal Communicator and Humane Educator. 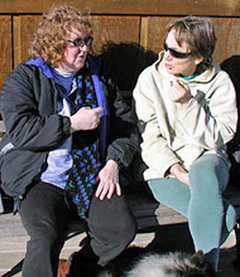 I apprenticed with Penelope Smith, Animal Communication pioneer for several years. I'm authorized to teach Penelope's Basic and Advance I Animal Communication Seminars. I studied Animal Reiki with Kathleen Prasad and became an Animal Reiki Master Teacher and Practitioner in 2008. I now offer Animal Reiki to all species around the world to help them feel their best and I teach people Reiki. I love giving animals a "voice," so they feel heard and understood. ​Plus it's an honor helping people better understand their animals. ​Since I was a teenager, I've been a student of holistic health and the healing arts. I've studied Healing Touch For Animals with Carol Komitor along with animal behavior, Feldenkrais, TTouch, Chinese medicine, acupressure, animal diet and nutrition, flower essences, homeopathy, Shamanism, and the animal-human bond. One of my specialties is my gift to communicate with deceased animals. Besides supporting you and your pet through illness, hospice care, and the dying process, I offer grief counseling to help you cope and deal with the loss of your beloved animal companion. I also facilitate reunions with reincarnated pets. "Cathy is truly a kindred spirit in her love and commitment to helping animals and people." Cathy is a contributor to these books. In Penelope Smith's book, Animals In Spirit: Our faithful companions transition to the afterlife, I share my experience about foreshadowing and preventing the death of my dog, KC the Keeshond. ​love to share their hearts with their humans. Mind to Mind, Heart to Heart - A Pet Psychic Documentary is a documentary featuring Animal Communicator Marta Williams and me. In the video, I demonstrate how Animal Communication works. Watch as I communicate telepathically with a Dove. I currently write a blog: Animal Muse Communication and Reiki where I share my experiences as an Animal Communicator, Humane Educator and Animal Reiki Master/Practitioner. Click here to read my blog. sI currently live in the San Francisco Bay Area where I share my life with my two cats, Mona Marie and Elvis, along with my Keeshond, Bodhi Bear. My animal family gives me divine inspiration, guidance, and love. In other words, they are my Animal Muse.